Roger is famous for his iconic monster movies and for his acclaimed Edgar Allen Poe cycle, starring Vincent Price. One of the first producers to make movies targeting, Roger has always remained prescient. The heirs to his films are big-budget Hollywood spectacles. The FAST AND FURIOUS series, the DEATH RACE franchise and the LITTLE SHOP OF HORRORS cultural phenomenon are all based on his properties. Roger's grindhouse style has greatly influenced filmmakers such as Quentin Tarantino, Robert Rodriguez and Eli Roth. Roger also discovered a generation of Hollywood talent including Jack Nicholson, James Cameron, Martin Scorsese, Francis Ford Coppola, Sandra Bullock, Will Ferrell, Mila Kunis, Gale Anne Hurd, Ron Howard, Peter Fonda, Jonathan Demme, John Sayles, Peter Bogdanovich, Joe Dante, Bruce Dern, Charles Bronson and many others. Born in Detroit, 1926, Roger received a bachelor's degree in Engineering from Stanford University and completed post-graduate work in modern English literature at Oxford's Balliol College. In 1954 he directed THE MONSTER FROM THE OCEAN FLOOR, thus beginning his slate of low-budget films for American International Pictures. In 1962, Roger directed his most daring film, THE INTRUDER with William Shatner, about the segregationist American South. Throughout the sixties, Roger's lavish and surrealist cycle of Vincent Price/Edgar Allan Poe horror films for AIP earned him international acclaim. In 1964, Roger became the youngest producer/director to be given a retrospective at the Cinémathèque Française. Corman pioneered the first biker movie, WILD ANGELS in 1966. 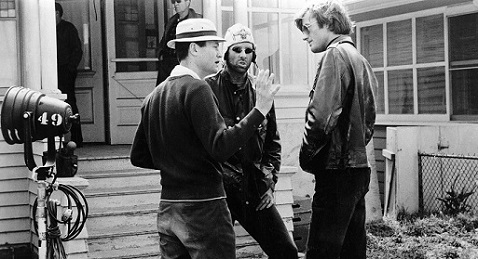 The film starred Peter Fonda and Nancy Sinatra and heavily influenced EASY RIDER. Corman also began the 60’s psychedelic film craze with his Cannes Premiere THE TRIP, written by and starring Jack Nicholson. Roger was one of the first American directors to bring foreign cinema to the States, distributing the films of Akira Kurosawa, Francois Trauffaut, Frederico Fellini, Ingmar Bergman and Werner Herzog through his company New World Pictures. In 1983, Roger sold New World Pictures to begin one of the biggest independent film distributors, Concorde-New Horizons. He received an Academy Award for Lifetime Achievement in 2009. Roger continues to make highly entertaining films under the banner of New Horizons Picture Corp. His recent film, video game parody VIRTUALLY HEROES, premiered at the 2013 Sundance Film Festival. Roger Corman lives in Santa Monica with his wife, producer Julie Corman, and their four children.